Photo by Jennifer Fumiko Cahill Freshman Jasmine Kates got her lacy tights at Kmart and her purple highlights back home in Los Angeles. She's amazed at how tall the trees really are up here. 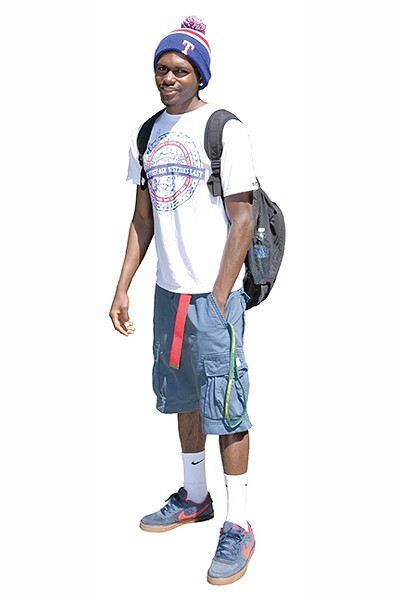 Photo by Heidi Walters Kemyni Johnson, a freshman from Los Angeles, wanted to be in the forest. With ocean still nearby. He didn't know the trees were going to be so tall. And he didn't expect so many other kids from Southern California. "It's a nice surprise," he says. And, yes, he is wearing red, white and blue: Crooks and Castles skateboarder shirt, Levi's, red Nike belt, blue-and-red Nike shoes, and his sister's Texas Rangers hat "because it matches." Photo by Heidi Walters Gabby Garcia, a psych junior transferring from Palm Springs, was prepared for Humboldt to be hippie-ish. To fit in, she picked up this black giraffe smock at the Hospice thrift shop, in Arcata. Hippies aside, the quiet, cool forest is even better than Garcia had hoped. 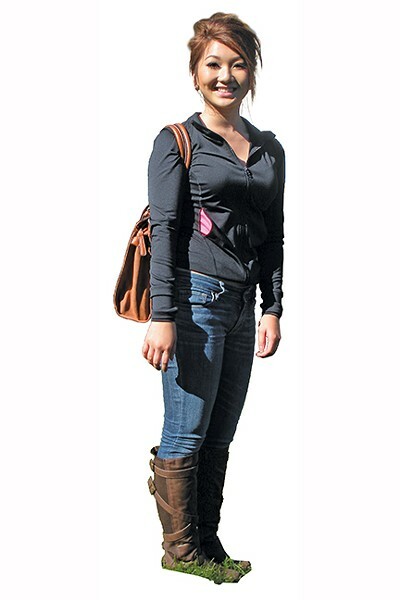 Photo by Jennifer Fumiko Cahill Eureka High grad Anna Lee is surprised to see so few of her classmates on campus. She's starting her college career in a running jacket and a leather schoolbag. Photo by Heidi Walters Nicholas Wilson's favorite pair of saddle shoes finally came apart in the Arcata post office. He patched them with packing tape. Perfectly good for cycling about, along with Levi's and the Eiffel Tower-in-bones T-shirt he bought in London. The cardigan's warm; Wilson, English-born but a junior transfer from San Bernardino County, expected cool, coastal forest temps. He's here to study biology and art. Photo by Heidi Walters The sunshine is making Shawna Fleming's hair spark copper. Her favorite earrings are gold. So are her flats. She likes gold. She also likes comfort -- flowing cotton pants, lacy-backed T-shirt. 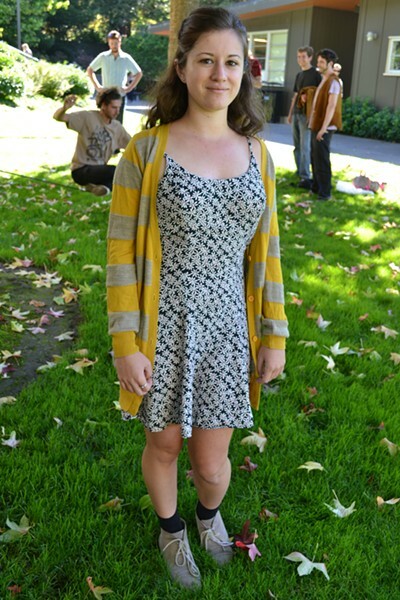 It's surprising, says the freshman politics major from Berkeley, how comfortable she is in Humboldt. Just one week in, and she feels at home. Photo by Jennifer Fumiko Cahill "I don't believe in pants," says freshman Haley Gordon — not pants with buttons and zippers, anyway. She hails from the Central Valley and came to Humboldt for the great bio program and the trees. Heidi Walters Check out Joey Raymundo, coming back from the gym: Hostile Kids shirt (after a SoCal paintball team). Blackhawks cap by Tisa (a New York City designer). Basketball shorts. "And some cool Diamond Supply socks – sweet!" The junior business transfer from New Jersey also wears rave bracelets. "You do this handshake and trade them at raves." One says "Neek," the other "Fireman." Raymundo's cool – he didn't need to see Humboldt before moving here. He knew it'd be awesome. "Everyone's super chill." Heidi Walters Emily Lynch wanted a small school, more contact with her instructors. The junior geology transfer from Sacramento didn't expect so much contact with transients. "I thought they were mostly in Eureka," she says. "There was one in the park near my house last night. I think I scared him to death." Lynch did know it could get chilly here – just throws her sweater from Japan over that hand-me-down sundress. 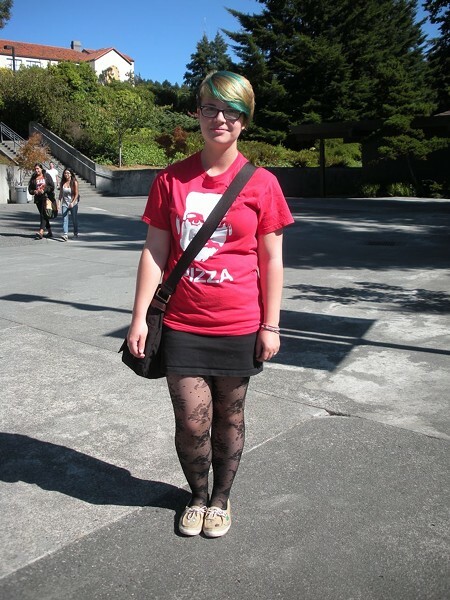 Jennifer Fumiko Cahill Journalism student Kat Tjosaas sports a John Green T-shirt and and lace tights for her first day at HSU. She's happily surprised to see "more eccentric fashion sense" than back home in Hondo. Jennifer Fumiko Cahill It got warm, so Michael Hoff rolled up his jeans. 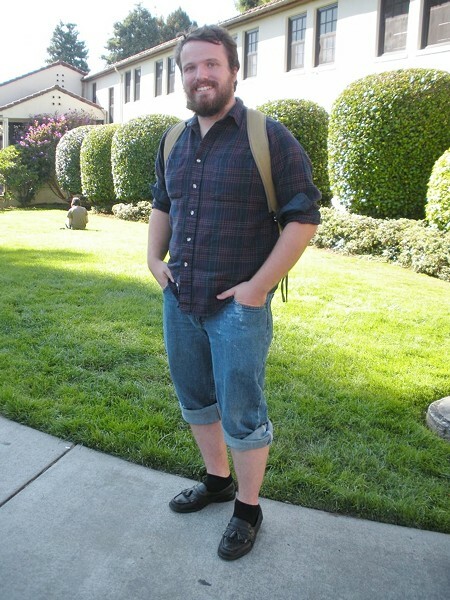 He transferred from Nevada City after falling in love with Humboldt during a brief stay, and he already looks like a local with his beard and flannel. Jennifer Fumiko Cahill Sierra Gilley is from a San Diego suburb, and her jacket is from the thrift store. She doesn't think matching socks matter, and she can't believe how friendly Humboldters are — after slowing down a fellow driver, she was amazed to get a peace sign instead of the bird. Jennifer Fumiko Cahill San Diego native Carlos Dervis chose his favorite jeans and some skater sneaks to give him a little confidence on day one. He came to Humboldt looking for a change of scene. "Moving day was my first day here," he says. Before that, he'd only seen Arcata online. 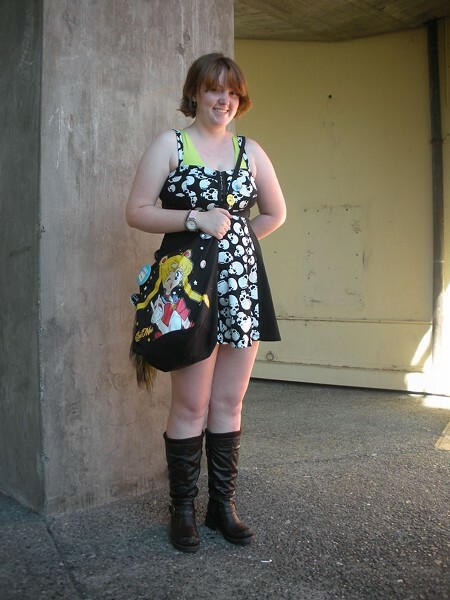 Jennifer Fumiko Cahill Miranda Winter got her Sailor Moon bag at Hot Topic. The Elk Grove transplant came here for the animals —she's studying zoology. That's right: they sell Sailor Moon bags at Hot Topic. What to wear on the first day of school? 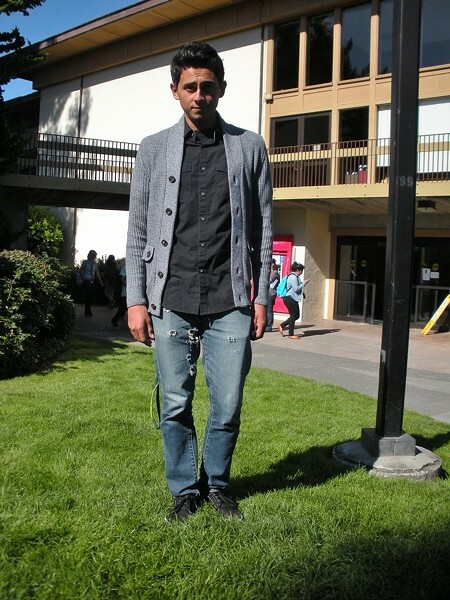 Here's what some of the newbies at Humboldt State University are working. Check out this first day chic.